The five-strong group of apprentices from modern day train operating company First Great Western (FGW) in Plymouth literally stepped back in time to sample the steam age today on Monday 7th April as they visited the nearby South Devon Railway (SDR) in order to learn about some of the principles of railway operating. The group, all be wearing their full FGW uniforms and accompanied by their manager, are pictured in front of Class 25 D7612 before heading back along the line to Totnes. 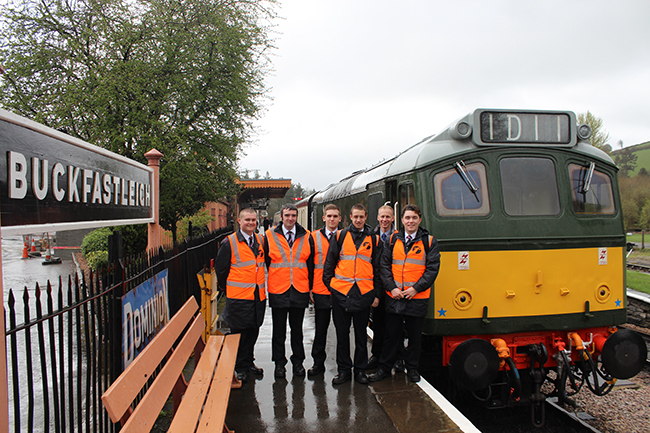 The visit was the brainchild of Robert Kitley, himself already an SDR diesel group volunteer, but who is also training as an apprentice with First Great Western. He approached the SDR with his idea which was happy to help out with the training programme and show the group around. During the flexibly timed but day-long visit, the group first travelled in a heritage diesel unit, W55000, dating back to the 1950s from Totnes to Staverton. At Staverton they experienced the operation of two old-style mechanical signal boxes at a busy passing point for trains, complete with hand-pulled levers, a locking room and manually operated signal arms. At Bishops Bridge the chance was taken for a guided tour of the signalbox, including explanations of the different methods of working employed on the line (One Train Working with Staff, Electric Key Token working etc) and there was also the chance to view the locking frame below the box – something that proved to be of particular interest. The group also had a chance to view the various On Track Plant stabled in the station yard, including the 07 tamper, and also took time to view the station and booking office at Staverton. The group then moved on to Buckfastleigh and, after looking around the running shed and visiting the footplate of 3205, they were given a guided tour of the workshop and boiler shop by Richard Elliott. Lunch was then provided in the refreshment rooms before a quick visit to the museum to look at Tiny and other smaller exhibits. The group returned to Totnes on the Class 25 D7612 which was also used to work an empty stock movement to Bishops Bridge. In the afternoon, they then inspected heritage diesel Class 25 loco No. 7612 and prepared it for service before leaving Buckfastleigh at 2.55pm with a train of empty coaching stock train destined for Staverton, and then returned to Totnes on just the loco at around 4.15pm to conclude their tour. The day was enjoyed by all and the feedback so far is all positive.